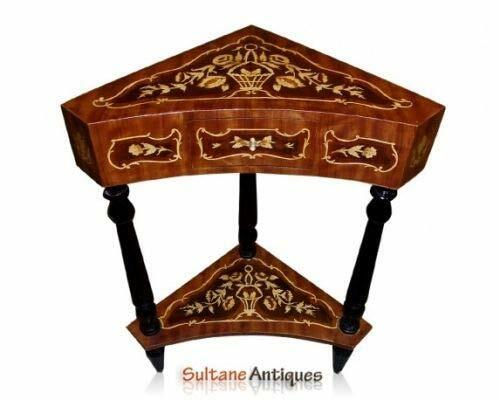 Add unmistaken luxury to any room with this French-style work of furniture art boasting two-and-a-half feet of polished hardwood that curtsies with daintily pierced skirt toward curvaceous cabriole legs and delightful escargot feet. Our Toscano exclusive is hand-carved to echo the fine craftsmanship of centuries past. 28½"Wx19½"Dx20½"H. 22 lbs. 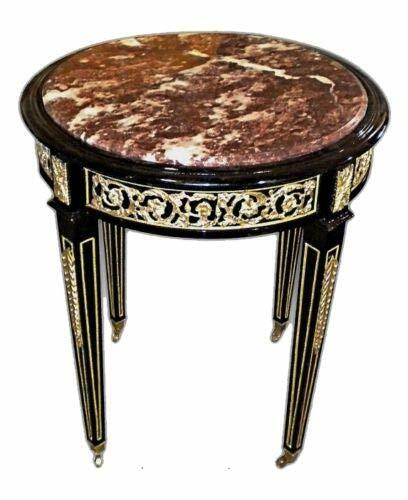 Classic Vintage Louis XV style round back side chair with carved details; two (2) available. Front and rear chair panels are upholstered in beige colored green stripe vintage European grain sack fabric. Seat is upholstered in a Manuel Canovas large scale floral print in beige, green and white. Nailhead trim. Whitewash finish. Great dining room, desk or accent chair! 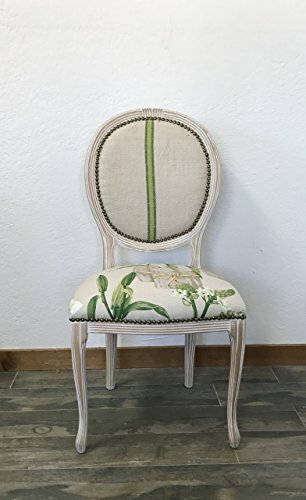 • Dimensions: 37"H Seat Width 19" Seat Depth 19" Seat to Floor 18 1/2"H • Fabric Content: 100% Organic European Flaxen Linen, Linen/Cotton Fabric • All sales are Final. Custom/Customized orders are not eligible for return and are nonrefundable. 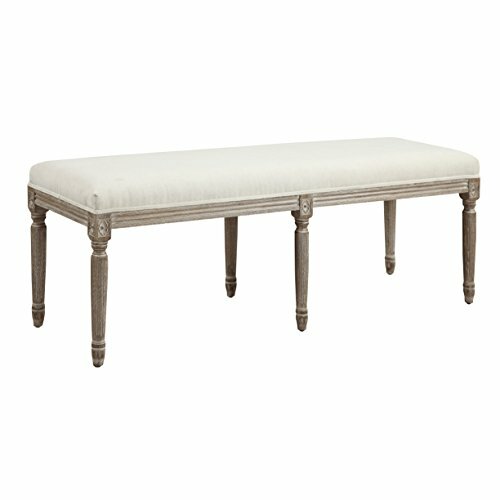 • Please note that furniture items are shipped to Continental U.S. states only. Items are shipped via FedEx/UPS. Contact seller with any questions or concerns prior to purchase. Classic Louis XV Bergere style square back side chair upholstered in striking Suzani print and vintage grain sack fabric. Front and back panels upholstered in vintage 100% organic flaxen linen European grain sack fabric. Grain sack is natural color with blue stripe. Stenciling and nailhead trim add to finishing details. Seat and arms are upholstered in an off-white Suzani print fabric in colors of blue, indigo, and turquoise. High gloss white lightly distressed finish. Great dining room, desk or accent chair! 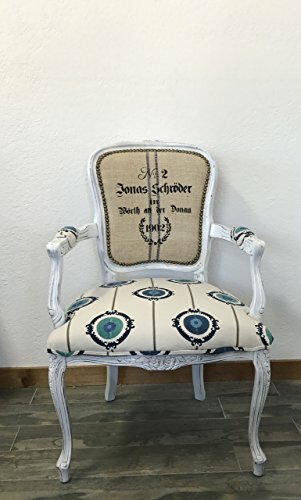 • Dimensions: 36"H x 18"W x 20"D Seat Depth 20"D Seat to Floor 18 1/2"H • Due to vintage nature of the chairs; dimensions may vary slightly • Chair can be fabricated without front and or back stencil; please contact seller if you'd prefer this option • All sales are final. Custom/customized orders are not eligible for return and are nonrefundable. 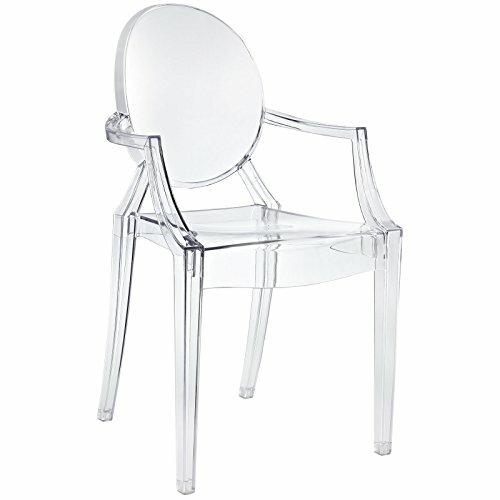 • Please note that furniture items are shipped to Continental U.S. states only. Items are shipped via UPS. Contact seller with any questions or concerns prior to purchase. Classic Louis XV Bergere style square back arm chair upholstered in striking Suzani print and vintage grain sack fabric. Front and back panels upholstered in vintage 100% organic flaxen linen European grain sack fabric. Grain sack is natural color with blue stripe. Stenciling and nailhead trim add to finishing details. Seat and arms are upholstered in an off-white Suzani print fabric in colors of blue, indigo, and turquoise. High gloss white lightly distressed finish. Great dining room, desk or accent chair! 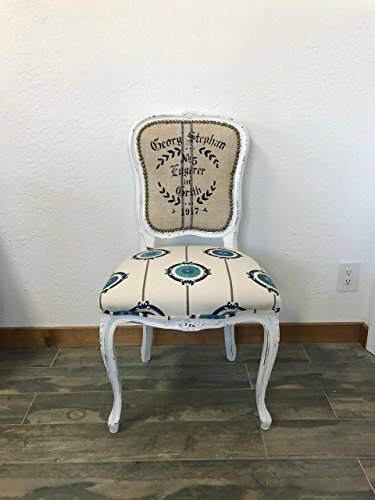 • Dimensions: 37"H x 24"W x 21"D Seat Depth 21"D Seat to Floor 18 1/2"H Arm to Floor 27 1/2"H • Due to vintage nature of the chairs; dimensions may vary slightly • Chair can be fabricated without front and or back stencil; please contact seller if you'd prefer this option • All sales are final. Custom/customized orders are not eligible for return and are nonrefundable. 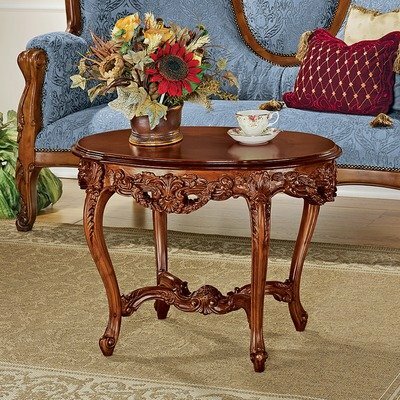 • Please note that furniture items are shipped to Continental U.S. states only. Items are shipped via UPS. Contact seller with any questions or concerns prior to purchase. 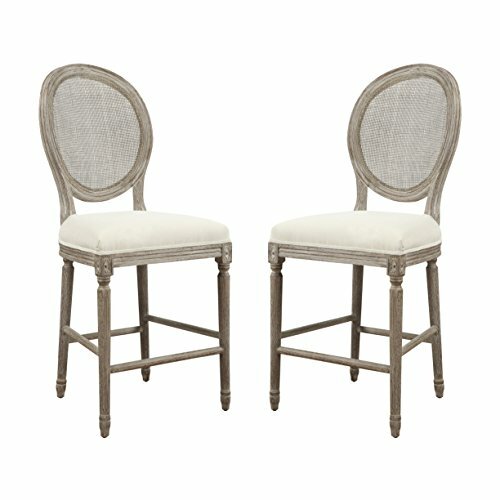 Compare prices on Louis Xv Furniture Style at Shopsimal.com – use promo codes and coupons for best offers and deals. We work hard to get you amazing deals and collect all avail hot offers online and represent it in one place for the customers. Now our visitors can leverage benefits of big brands and heavy discounts available for that day and for famous brands.